The 1 Chinese Yuan Renminbi note is a denomination of Chinese currency. A Chinese communist revolutionary, politician and socio-political theorist Mao Zedong commonly referred to as Chairman Mao (December 26, 1893 – September 9, 1976) and a Orchid flower are currently featured on the obverse of the note. 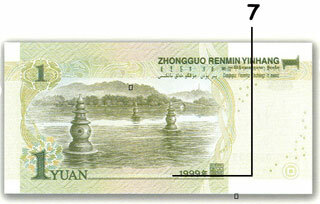 On the reverse of the banknote is an image of Three Pools Mirroring the Moon at West Lake. The two-colored serial number has four red and six black characters. Hold the note to light and look for the watermark, similar to the Orchid flower. The watermark is part of the paper itself and can be seen from both sides of the note. Some parts of portrait of chairman Mao are made by intaglio printing and feels raised when running your finger over it or scratch it gently with your fingernail. Lines printed in the right of the 1 Renminbi/ Yuan note, made by intaglio printing feel raised. 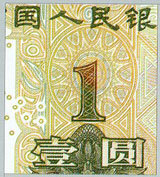 When the banknote is viewed from a certain angle, the number "1" appears at the top right of the note. Special printing makes the ink feel raised in some areas of the note. 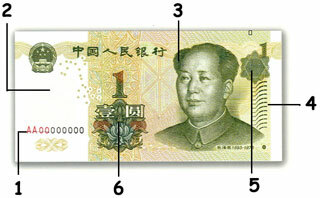 The letters, 'RMB", and the numeral, "1" can be viewed with the help of a magnifying glass on the reverse of the note.